2012 North American Copper in Architecture - Copper Development Association Inc.
A multi-faceted public artwork, "Passage" by Mags Harries and Lajos Héder with poet Alberto Rios, begins with steel letters embedded in concrete in the plaza at the library's west entrance and continues to a shaded pathway that connects the library to the Western Canal Bridge, providing a pedestrian link to the Legacy Village Shopping Center. Speakers set in acoustic chairs in the plaza play recordings of poetry curated by Rios that reflect the community and local landscape. Four trellises spanning the path between the library and canal feature cut-out letters that cast poems in shadows along the path. The project was commissioned jointly by the Phoenix Office of Arts and Culture Public Art Program and the Maricopa County Community College District. Download a bookmark about the project. "Baseline Blooms" is a collaborative community poem compiled by Arizona poet Alberto Rios. More than 30 community members of all ages submitted a few words, a line, phrase, short memory or observation about South Mountain communities, including Phoenix and Laveen. The poem was presented at the library's one-year anniversary celebration on September 29, 2012. Download a bookmark of "Baseline Blooms" in English or Spanish. 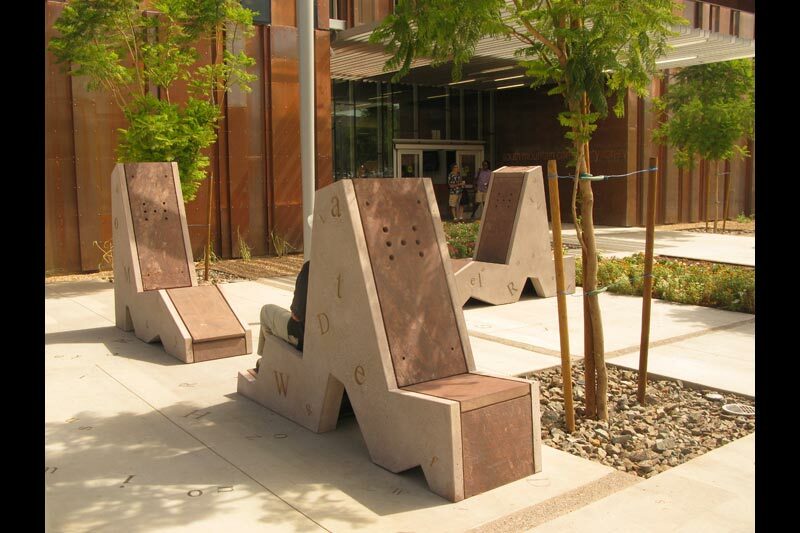 Ever wonder what those concrete alphabet chairs outside of the library's west entrance are all about? A multi-faceted public artwork, "Passage" by Mags Harries and Lajos Héder with poet Alberto Rios, begins with steel letters embedded in concrete in the plaza at the library's west entrance and continues to a shaded pathway that connects the library to the Western Canal Bridge, providing a pedestrian link to the Legacy Village Shopping Center. Speakers set in acoustic chairs in the plaza play recordings of poetry curated by Rios that reflect the community and local landscape. Four trellises spanning the path between the library and canal feature cut-out letters that cast poems in shadows along the path. The project was commissioned jointly by the Phoenix Office of Arts and Culture Public Art Program and the Maricopa County Community College District. Visit the Harries & Heder website to learn more about this interactive art installation. Each corner of the library has a plant-based theme, honoring the agricultural history of South Phoenix. The theme is echoed in the glass-etched and metal railing designs of each corner, uniquely identifying each area of the library. Northeast- Citrus: represents the fact that Arizona is in the top ten of the nation in production of citrus. Northwest- Aster: pays homage to the flower gardens that lined Baseline Road for decades. Southeast- Sorghum: form of grass historically cultivated as a sweetener that is used in some of our furniture. As a renewable resource, it grows fast and uses little energy, making it quite sustainable. Southwest- Cotton: one of Arizona’s five C’s that is still grown in this area today.